Over the past 12 years, the Regal International Group has achieved an impressive track record of constructing and completing a range of property development projects in Kuching and Kota Samarahan areas of East Malaysia. This diverse property portfolio includes shop houses, landed residential properties, condominiums, commercial and industrial units. 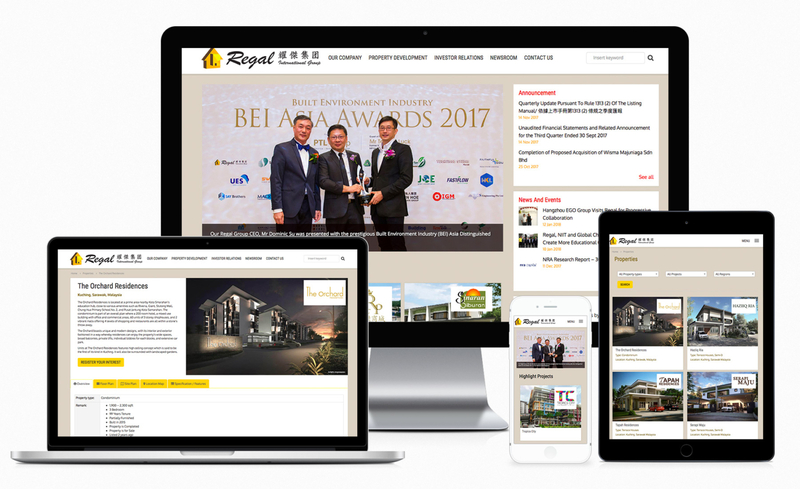 The Regal International Group has in recent years added Nilai (Negeri Sembilan, West Malaysia) and Bintulu (Sarawak, East Malaysia) to the geographical coverage of its property division. Design a property development website with the modern and responsive layout, with the friendly interface for end-user. With a dynamic content modules that is easily to manage their content without a programming knowledge, to be easy for them to update the content by themselves anytime. Property listing with friendly property type filter.